Inequality goes beyond the wealth and income disparities that frequently make it into today’s headlines. Employer benefits also flow more freely to people at the top. The newly released survey of employers by the U.S. Bureau of Labor shows how stark the differences are. The charts below compare the share of private-sector workers in the lowest income bracket who receive benefits – their earnings are in the bottom 25 percent of all U.S. workers’ earnings – with the share in the top 25 percent. 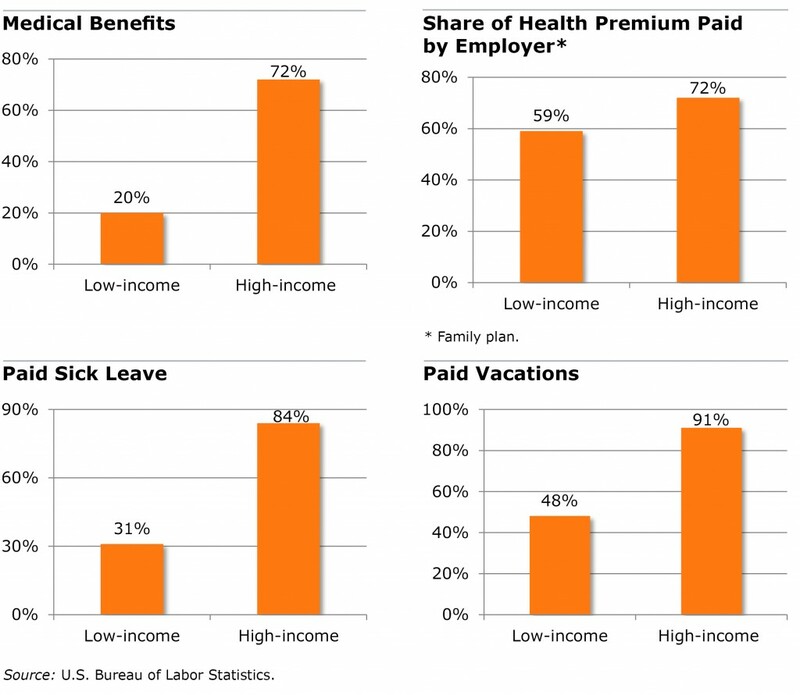 Four benefits are compared: health insurance, the percent of health premiums paid by employers, paid sick leave, and – since it’s August – paid vacations. The BLS data don’t tell the full story. First, no adjustments are made for age, and many low-wage young adults might work part-time or be loosely attached to the formal labor force. Also the healthcare landscape has shifted since enactment of the Affordable Care Act, and lower-income people who lacked access to employer health insurance can now buy it through exchanges in their states. The White House estimates that some 11 million Americans are enrolled, while millions more receive health coverage through Medicaid. Not shown in these charts is the large segment of the labor force employed by federal, state and local governments which, according to related BLS data, tend to provide more benefit coverage to their lower-paid employees. Nevertheless, disparities have been shown in rigorous studies of another type of benefit: retirement savings plans. For example, a 2014 study of low-income older workers by the Center for Retirement Research, which supports this blog, found that only 12 percent save money in 401(k)-style plans.